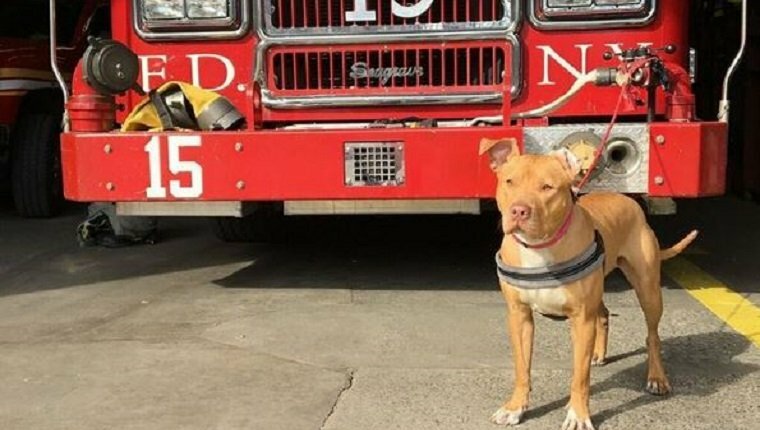 Ashley the Pit Bull is a beloved member of a Fire Department of the City of New York (FDNY) on the Lower East Side. She’s their official firehouse dog, but it wasn’t that long ago that she was in a very different environment. She was found by animal rescuers in a crack house in Staten Island, malnourished and covered in cigarette burns. She was left for at least two days without food, water, or anyone to care for her. Ashley’s rescuers, Erica Mahnken and Michael Favor, are the founders of No More Pain Rescue. At the time, they had nowhere to place Ashley, so they contacted some of their firefighter friends over at a station aptly nicknamed “Fort Pitt” to see if they could take care of the pup for a while. The firehouse used to have a Rottweiler, and they were happy to care for Ashley for a bit. After only a few days, the firefighters contacted Mahnken and Favor and asked if they could keep Ashley, or Ash as the firefighters call her, as their official firehouse dog. Of course they agreed, and Ashley has since become the star of the FDNY. She loves to go on ride alongs and has her own spot on the firetruck. The friendly pup gets along with everybody, and she even has her own Instagram page where she’s getting plenty of love from fans. She’s putting on more weight and becoming a happy, healthy girl surrounded by her loving firefighter buddies. Are you happy to see Ashley in her new home? Would you like to see more firehouses providing homes for dogs in need? Let us know in the comments below!